Well, it is Wednesday, been a real busy week so far. Monday I went to Gatlinburg, that was a busy day. A friend of mine came out for a visit and we went out to check out the Galleries in the city there. Unfortunately not many shops carry abstract art, and the few who did, most were owned by that artist and only carried their own works. The one shop that did carry many artists and did have abstracts on display is a juried gallery, so it will be a long process, and a bit costly. Minimum $100 a month for a small area, plus 30% of sales. So unless I blow out the gate, it will be a while before I profit. Not sure what I think of that yet. I am trying to weigh out the pros and cons, not looking so good on the pros. Yesterday a transformer blew out and that left me with no power for several hours. 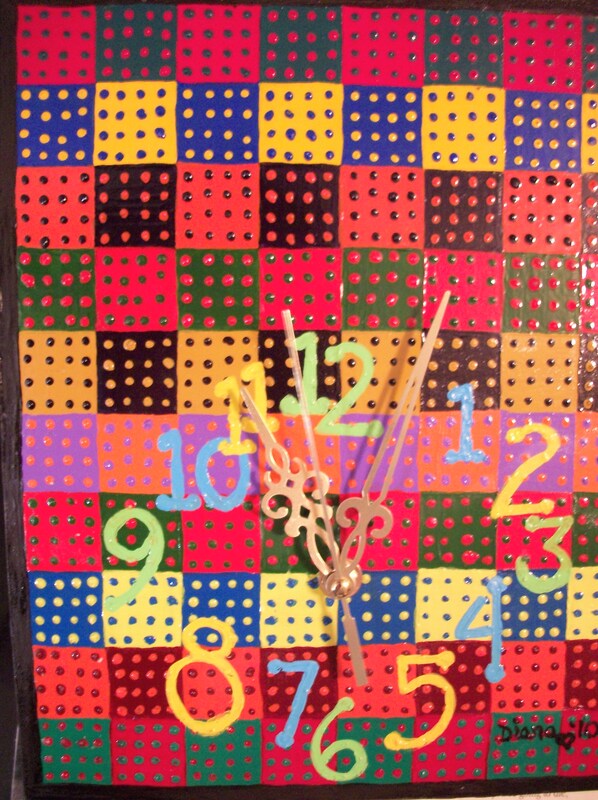 So I got busy finishing a clock a friend gave me. I painted it in my silly abstract style and it will be displayed here today. I also finally got a picture of the notorious top I crocheted. It is quite colorful, I am thinking of making a white one one day. It is really comfortable and girly, I think it turned out quite pretty. Love to hear what you think. This entry was posted on May 26, 2010 at 11:17 AM and is filed under Uncategorized. You can follow any responses to this entry through the RSS 2.0 feed. You can leave a response, or trackback from your own site. Thank you very much. I am glad you enjoy it. I very much appreciate the time you took to leave a comment. Hope you have a wonderful week, and looking forward to seeing you, or hearing from you again!